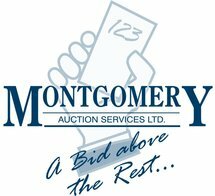 30TH ANNUAL SPRING EQUIPMENT CONSIGNMENT in Blackfalds, Alberta by Montgomery Auction Services Ltd.
NO LONGER ACCEPTING CONSIGNMENTS. WE ARE FULL. QUANTITY OF ASSORTED LIGHTBULBS, SMOKE DETECTORS, DOOR CHIMES, WATER PUMP DETECTORS, EXTENSION CORDS, LITHIUM BATTERIES, BATHROOM LIGHT & FAN FIXTURES, GABLE VENTS, MARRETS, CONNECTORS, RECEPTACLES, CIRCUIT BREAKERS, TARPS, BUNGEE CORDS, COMMUNICATION CABLE, ELECTRICAL WIRE, PAINT, ETC. 20+ PALLETS OF NEW EUROSHIELD HIGH IMPACT RUBBER SHINGLES - HAIL RESISTANT IMPACT UP TO 20" DIAMETER.